I am speechless !!!.. an INSTANT favourite !!! Excellent photography,great contrast and perspective! Unique and intriguing composition. The balancfe and lines are grand. Superb picture. Congratulations for the double SC & BIP awards in tihis great image Yusuf!!! sevgili yusuf oldukça güzel bir kare. dingin ve minimalist. tebrik ederim. selamlar. Safak bey; degerli begeninizle fotografimi onurlandirdiginiz icin cok tesekkur ederim. Saygilar. Hakan bey;Begeniniz bana mutluluk verdi. Saygilar. My dear frend Mohamed. Thank you so much. Best Regards from Turkey. Thank you very much. Glag that you like it. Regards. I want to thank everybody for comments and critiques from here. I'm very happy for awards. Again and again thank you so much my friends. Best Regards. Yusuf Bey , elinize saglik ! Cok guzel bir kompozisyon. mükemmel diye tabir etmek bile bu fotografa haksizlik olur.. tebrik ediyorum.. Very meaningfull photo of you.Perfect composition and tones.I would like to see the person b/w too. yusuf bey fotografınız cok hos. gr8 pic & title, salam. Outstanding image! Well done and congratulations. Great shot! excellent composition! well done! Excellent concept, perspective and composition. I too would like to see the front of the picture in sharper focus but think the man in red makes this composition less static and a cut above the normal stair/jetty shot. Simple and beautiful,great shot...love it!! impressive texture and great Staff Choice deserved it! Congrats for Photoof the day! 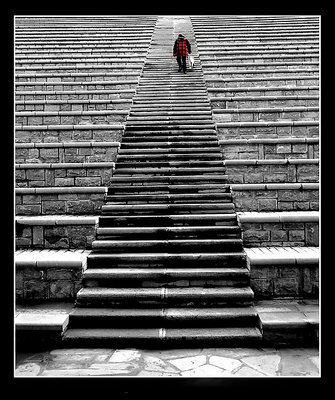 I like the steps and composition. The front steps are slightly out of focus which is a shame as they are in a dominate part of the photo. I do not like the person, I find the red colour to be out of context with the rest of the picture, I would prefer if he was not in colour. Excellent dynamic shot full of impact. Maybe needs a little straightening...perhaps. But still good as is. fantastic framing. It looks teriffic. The B&W to the red man contrast works great. Excelent work! Very nice image Yusuf, vrery graphic. Simple and powerful composition, nice contrast bw and colour! S U P E R B !!!! !